Steel and sorcery clash as the Harhn incursion sweeps through the Hugue. Only Lord Baudouin and Lady Lucia, a Dragon Maiden from the Order, stand in the enemy’s path. Only together will there be any hope to repel the onslaught, and preserve the future for a mysterious girl they do not know. My children more than anything. For years, I had shared stories at bedtime about mystical places, valiant heroes and dastardly villains. The time had finally come to put some of my saga on paper. Ah, so many of us let loose our imaginations at that time. It’s a reflection of the region I’ve created. Amidst the multiple principalities are Kings who rule them. But if truth be told, they are but shadows compared to the glorious kings of old that dwell in the Ancient Lands of my world. I’m fantasy geek, plain and simple. I will be experimenting with Urban Fantasy in the future, but for now, my loyalty lies with Classical Epic Fantasy. And my Dragon Rising series has just begun, so Dragon Maidens and Darkfey will dominate most of my time for the next few years. The readers will be glad to hear that. Child molesters. No jail time, no parole. If caught and convicted, you are hung by the entrails. Most of my inspiration comes from my children…the rest from pure imagination and the wonderful stories I’ve read over the years. 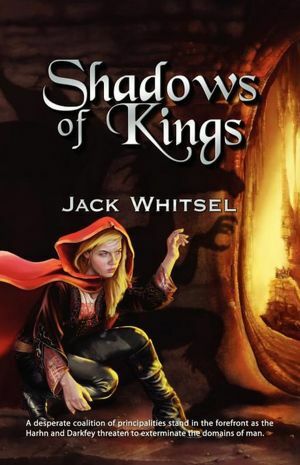 I’m very proud of SHADOWS OF KINGS and I’m thrilled to share it with you. I am currently with a small press – Twilight Times Books. I have never self-published, but it’s a path that more are taking everyday. Who knows, maybe I will decide to go that route in the future. For now, I enjoy being part of a family of reputed authors. Twilight Times Books is still in a steady growth phase, and I’m thrilled to be in their stable. One month ago, a new addition to the family was added. We named her Lucia – after the main character in my book. You can also snag a copy at Jan’s Paperbacks – some are even autographed. Thanks for taking the time to share with us Jack. I think Dragon Rising is going to become a jewel on the shelves of all fantasy readers. I’m sure we all wish you the very best of luck. Thanks for allowing me to visit your site. You are truly a gentleman amongst your peers! Thank you for braving the venue Jack. Your reputation may never be the same again.